The death toll from an earthquake and tsunami in Indonesia has increased to 1,407. National disaster agency spokesman Sutopo Purwo Nugroho said in Jakarta on Wednesday afternoon that 519 of the bodies had been buried. The magnitude 7.5 earthquake and the tsunami it generated devastated the city of Palu and nearby communities in Central Sulawesi province. President Joko “Jokowi” Widodo visited the city Wednesday and said aid was starting to arrive. Indonesia’s military chief says soldiers and other forces have been deployed to the stricken port city of Palu to guard key infrastructure, fuel depots and the airport and stop any attempts at looting. Chief Air Marshall Hadi Tjahyanto said Wednesday outside a collapsed hotel in the city that his forces were taking steps to ensure that security will be enforced. He spoke as many of the city and region’s residents scrambled to get food, water and other supplies — with many resorting to taking things from shops and markets. “Military personnel have been deployed to fuel depots, ATMs, markets and the airport to ensure that economic activities are running. It will give the sense of security to the people so hopefully there will be no more looting,” he said, adding that all supply convoys into the city will be escorted by armed soldiers. Indonesian President Joko “Jokowi” Widodo has arrived in a hard-hit city to see damage and recovery from the earthquake and tsunami that struck a central island last week. Widodo was expected to tour various areas and visit a hospital Wednesday. The government has said hundreds of people were severely injured in Friday’s disasters. And the official toll of 1,234 dead is expected to grow as more bodies are recovered in the damaged areas. He said foreign aid is starting to reach the area. President Donald Trump called Widodo on Tuesday to offer assistance with both the emergency phase and reconstruction. Widodo said there’s still a lot of work to be done, but he added that conditions are improving. Aid was trickling into areas crippled by the devastating earthquake and tsunami on Indonesia’s Sulawesi island, with residents in one neighborhood clapping, cheering and high-fiving at the arrival of a supply truck. 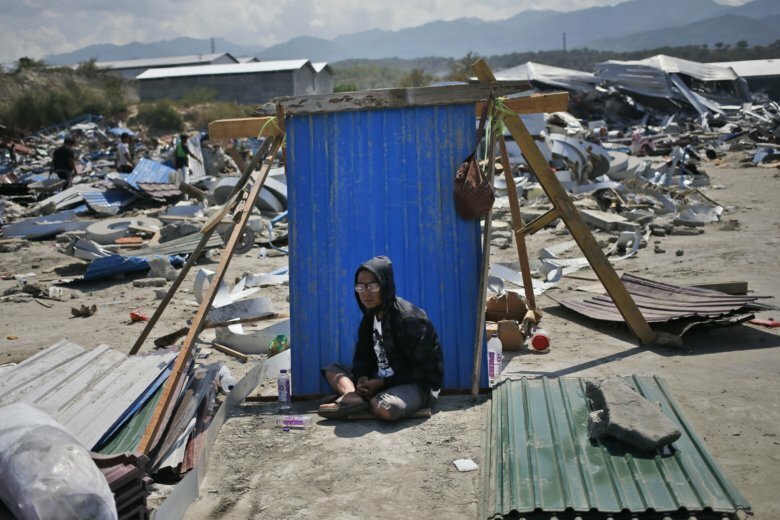 Food, water, fuel and medicine had yet to reach the hardest-hit areas outside Palu, the largest city heavily damaged. Many roads in the earthquake zone are blocked and communications lines are down five days after the magnitude 7.5 earthquake and tsunami struck. The official death toll reached 1,234, while scores of uncounted bodies could be buried in collapsed buildings. The U.N. humanitarian office said people urgently require shelter, clean water, food, fuel and emergency medical care. Australia will send more than 50 medical professionals to Indonesia to help with the aftermath of a devastating earthquake and tsunami as part of a 5 million Australian dollar ($3.6 million) aid package. Payne says she has been in contact with her Indonesian counterpart Retno Marsudi and Australian Prime Minister Scott Morrison is continuing talks with President Joko “Jokowi” Widodo about possible further support. The U.N. says its humanitarian office is reporting that “needs are vast” following the earthquake and tsunami in Indonesia, with people urgently requiring shelter, clean water, food, fuel and emergency medical care. U.N. deputy spokesman Farhan Haq said Tuesday that U.N. and relief agencies are on the ground or en route. He said the agencies are working closely with the government to provide technical support. Haq told reporters at U.N. headquarters in New York that water is the main issue because most of the water supply infrastructure has been damaged. He says the Indonesian Ministry of Social Affairs has asked the U.N. children’s agency, UNICEF, to send social workers to the affected area to support children who are alone or became separated from their families. Haq says the World Health Organization is warning that a lack of shelter and damaged water sanitation facilities could lead to outbreaks of communicable diseases.